Join us in beautiful Sri Lanka for a magical week devoted to YOU. Dive deep into self exploration through yoga and meditation practice, reconnection with mama Nature, and beautiful human connection. Nourish your body with amazing food, enjoy the Ocean or chill by the pool, explore this beautiful island, and celebrate New Year in style. We are offering four different weeks / dates for the retreat. Since you will be joining our teacher training group, each week will have a different theme and focus, please check below. It’s New Year’s retreat so our focus is to have fun, enjoy life on the island and of course, enjoy yoga practice. Our mornings will start with meditation followed by Integral Vinyasa Yoga practice. We’ll make the morning classes fun, but will also focus on alignment, modifications and giving you tools to find more strength, joy and fluidity in your practice. This week will be more about anatomy and biomechanics, so during morning Integral Vinyasa classes, you will hear many anatomical terms and explanations. 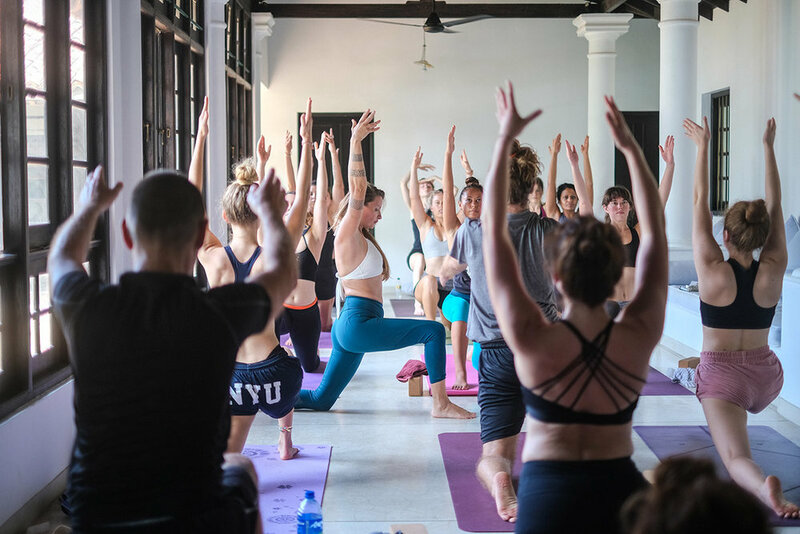 We will guide you through themed Integral Vinyasa yoga classes focusing on strength and flexibility of different muscle groups/joints and teach you how to recognise those ‘places of potential’. If you are interested in Subtle anatomy, Five Elements, and Ayurveda, this might be the week for you. Each morning we’ll guide you through Integral Vinyasa - Elemental Flow practice, tapping deeper into the subtle body/mind. Last week is dedicated to Chakra Vinyasa flows, going deeper into the subtle anatomy, but also into some more advanced asana, meditation and pranayama practices. This week will be perfect for advanced practitioners as well as yoga teachers. You are welcome to join us for two or even three weeks as well. Spots are limited. Our retreat villa is located in Ahangama on the South coast of Sri Lanka, tucked away in the jungle, yet 10 minutes walk to the beach closest beach. Wake up to the sound of peacocks and other birds, watch monkeys eat bananas and papaya from your terrace, then walk to the beach for completely different scenery. Sri Lanka is lush and so rich with life. We will practice yoga on a 1st floor enclosed terrace with wooden floor and view to the garden. Villa is fully staffed, together with an onsite chef who will prepare delicious meals out of local, organic ingredients. It is quite large and has much space for everyone to enjoy alone time. All rooms are en-suite and spacious. You can also choose to stay off site, if you are travelling with your family this might be a better option for you. Morning Integral Vinyasa classes as well as afternoon sessions will be taught both by Nina and Jasna Perin. Mornings are dedicated to a more intensive Vinyasa class, and each afternoon we will have a different programme - form meditation and alignment lectures you can join, to movie nights. On the 31th we will organise a special New Year’s Eve dinner followed by a celebration. Accommodation is based on two or three sharing. Sorry, no single rooms available in the villa. Please email us for possible arrangement of single accommodation in near by hotel. 300 euro non-refundable deposit is required to reserve your spot.